The Kosher Palette is a beautiful hardcover book featuring a concealed-wire binding filled with color photos to illustrate the finest in kosher cuisine. Within these pages you will find more than 300 extraordinary recipes for elegant, healthful dishes that taste as sensational as they look and don't take forever to prepare. Seventy stunning full color photos are certain to stir your senses as you create simple yet sophisticated menus for everyday dining and special celebration. Indispensable advice on wine, holiday treats, dazzling table decorations and sumptuous centerpieces will help you to enhance every aspect of at-home entertaining. TIps on crafting everything from place cards to ice bowls compliment dozens of unforgettable personal anecdotes from some of America's most innovative kosher cooks. 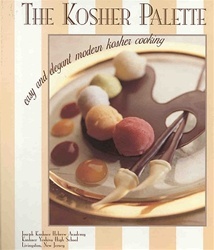 Carefully edited and clearly presented, all KOSHER PALETTE recipes emphasize ease, elegance, expressive style.